The Benham or Philippine, is a seismically active undersea region and extinct volcanic ridge located in the eastern Philippine seaboard facing the Pacific Ocean. MANILA, Philippines — President Rodrigo Duterte will no longer push through with his plan of riding a jet ski to the Philippine or Benham Rise, an underwater plateau off the coast of Aurora. On Tuesday morning, jet skis were spotted aboard the Philippine Navy's BRP Davao del Sur, where the commemoration rites of the first year of the renaming of Philippine Rise will be held. According to Special Assistant to the President Bong Go, he and presidential son Sebastian "Baste" Duterte will be riding a jet ski through the waters in the Philippine Rise area. The younger Duterte, however, would appear to be only riding through a vast expanse of water since there are no islands in the area as the Philippine Rise is an underwater plateau. In 2016, Duterte made a promise to ride a jet ski with a Philippine flag in hand to assert the country's claim over the West Philippine Sea. The president admitted that his campaign promise was "just talk." The Philippine Rise, on the other hand, is situated on the eastern side of the country, serving as a gateway to the Pacific Ocean. 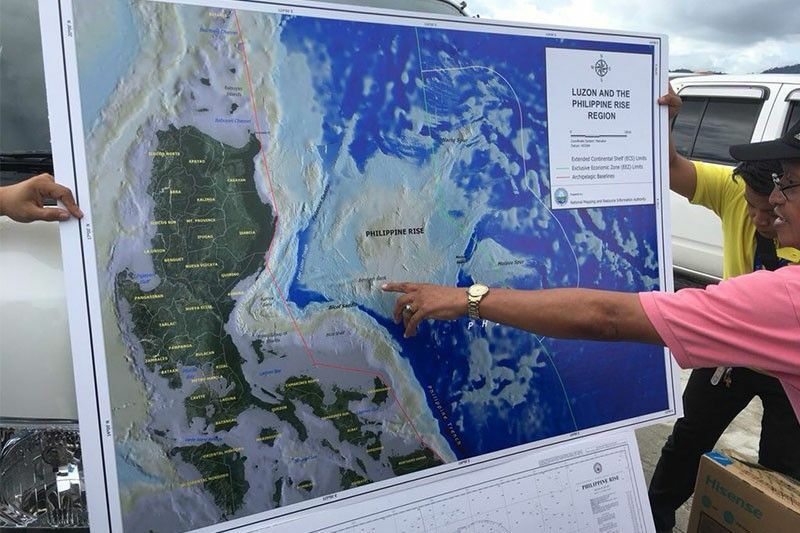 The president will be sending off an all Filipino 50-man survey team to the seismically active undersea and volcanic ridge to officially launch the team's research. Duterte earlier formed the team of Filipino experts to assess the country's sovereignty over the region. In 2012, the United Nations Commission on the Limits of Continental Shelf awarded Benham Rise to the Philippine as an extension of its continental shelf, granting Manila "sovereign rights" over the region. No country, including China, is disputing the Philippines' sovereign rights over the area despite its marine scientific research over the undersea region earlier this year. Rep. Ruffy Biazon (Muntinlupa), vice chairperson of the House defense panel, tweets a retort after Senate President Koko Pimentel downplayed the move of China to rename some parts of Benham Rise, an underwater plateau administered by the Philippines. President Rodrigo Duterte won't be riding a jetski in the Philippine or Benham Rise after reports that he may do so when the watercraft was seen aboard the Philippine Navy's BRP Davao del Sur. Instead of him, presidential son Sebastian Duterte and Special Assistant to the President Bong Go, who has been visible in media events lately and is projected to run in next year's senatorial polls, will be riding the jetskis. Spokesperson Harry Roque explains President Rodrigo Duterte's "firm stance that any country that wishes to conduct research or any other study" in Benham Rise, an undersea territory he recently named "Philippine Rise," should secure a permit from National Security Adviser Hermogenes Esperon. Duterte, however, last month imposed a ban on all foreign-led researches in Benham. Foreign Affairs Undersecretary Ernesto Abella says the Philippine government plans to contest the China-named features in Benham or Philippine Rise. "Actually, we have raised the issue of unauthorized researches conducted by the... Chinese Academy of Sciences during our bilateral consultation mechanism in Manila which was held last February 13. Both sides agreed that all marine science research henceforth must have the consent of the Philippines." President Duterte defends China's move to rename some undersea features in Benham Rise despite a supposed diplomatic protest by the Philippines. Duterte unfazed by China's naming of 5 Benham Rise underwater features: "Ang alam nila Chinese. Directions lang yan na tapos na sila diyan." "The Chinese just know Chinese (languages)," Duterte says in a speech. He says the Chinese names for the features only serve as directions. The president also goes soft on the ban on foreign research undertakings in Benham Rise, saying the directive is only "for the meantime." Antonio Carpio, senior associate justice of the Supreme Court, says the Philippines has the rights to name undersea features within its exclusive economic zone and continental shelf. Still, the Philippines should also task a government agency to approve names of such features, reports CNN Philippines.